The Desert Tortoise is the queen of the desert, elegantly adapted to life in a dry climate with huge swings in temperature. It is the state reptile of both California and Nevada, and lives in the Mohave and Sonoran Deserts. This species escapes the heat of summer and the cold of winter by spending 95% of its time in its burrow. Burrows range in depth from 3 to 6 feet below ground. They may sometimes be connected and in use by several tortoises at the same time. The desert tortoise is most active in spring when the desert blooms with grasses, herbs, flowers, and new cactus growth. Most of its water comes from eating these plants. The tortoise can survive for a year or more without drinking water. It is a resourceful creature and digs catchment basins in the soil for holding water. When it looks like rain, the tortoise hangs around a catchment basin waiting for a welcome drink to fall. The desert tortoise is listed as endangered in the wild, and it is a federal and state offense to move, touch, or disturb wild tortoises. It is also illegal to release captive-raised desert tortoises into the wild. They may carry a respiratory virus which has already decimated wild populations. In an ideal world, desert tortoises can live to be 80 years old. Life is precarious on the fringe. Females do not breed and lay eggs until they are 15 or 20 years old. The survival rate of hatchlings is 2 or 3 per 100 hatched tortoises. Gila monsters, kit foxes, badgers, roadrunners, and coyotes all prey on hatchlings. The intrusion of people into desert areas has severely limited the habitat of the desert tortoise. Ravens, which consume an abundance of hatchlings, have come as tag-alongs to humans. In 1950, there were approximately 200 desert tortoises per square mile. Now there are between 5 and 60 desert tortoises per square mile. As the climate changes, fringe habitats are the first to change as there is no significant buffer zone. Hatchlings can survive temperatures only up to 95 degrees. A temperature change of only a degree can be huge when one is already living on the threshold. “Desert Queen” is another stone sculpture in my Endangered Species Series. 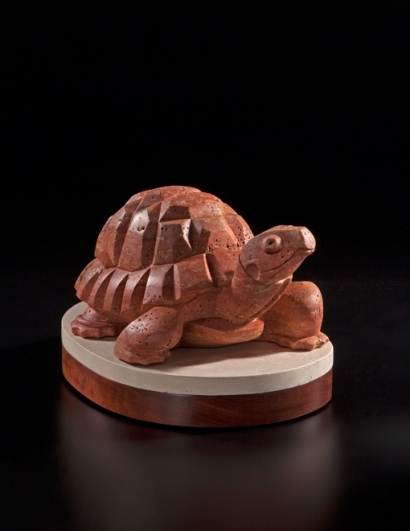 Part of the purchase price of this piece was donated to the Desert Tortoise Preserve Committee to protect desert tortoises and their habitat. The stone is Red Travertine, which forms in caves with water percolating through it over geologic time, i.e. hundreds of millions of years. The moving water creates porosities in the stone called vugs. The vugs come in a variety of shapes and sizes: worm holes, honeycombs, rivulets, some lined with calcite crystals carried through the stone in the water. The layers of color are compressed layers of different sediments and each has a different hardness. Carving red travertine requires care and vigilance as the tools tend to gravitate toward and dwell in the vugs. A push-pull pressure on the tools must be used to avoid getting stuck in a vug, and to avoid taking off too much stone in a soft layer. The stone’s colors and texture are reminiscent to me of desert colors and the rugged texture of tortoise skin and shell. I gladly spent the extra time and effort to coax this beautiful Queen from a complex and beautiful stone.